We went up to Otow Orchards (located in the Sierra foothills) to see persimmons peeled, tied by the stem with twine and hung in the sun to dry. Massaged daily for six weeks the end product looks fuzzy white and taste a little like mochi. The ninety-two year old grandmother was there peeling persimmons with the warming sun on her back. 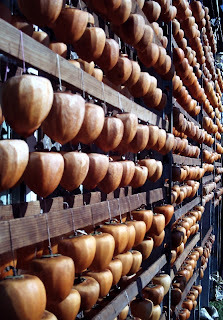 The dangling persimmons reminded me of lanterns or pendulum bobs. It was a beautiful sight. My mom loves hoshigaki as much as I love fuyu persimmons. I have one persimmon the birds didn't get; I brought it in and it is hard as a rock. Perhaps I should try this with it. At first glance I thought those that were hanging were clay lanterns, such a beautiful photo. Really surprised to discover Hoshigaki on your blog!! I love Hoshigaki. 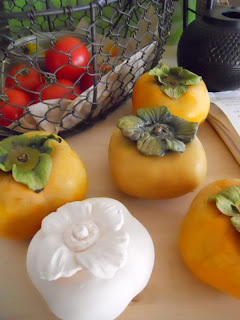 The white porcelain persimmon is so beautiful!! Persimmon season has started here and various kinds of persimmon are now on sale. How interesting that the persimmons are massaged into flavor for Hoshigaki! -it must taste delicious! Love your porcelain persimmon - beautiful! Hello Linda--Sometimes if you let the persimmon sit for a few days it will soften. The round persimmons (fuyu) I eat like an apple. There were racks and racks of dangling persimmons at the farm. So thoughtfully trimmed, twined as couples, too. Hello sapphire--Persimmons are my favorite. I wait each fall to see them show up in the markets. It was quite a sight to see all those beautifully trimmed persimmons basking in the sun!